Hundreds of tsa-tsas at Buddha Amitabha Pure Land, Washington, US, June 2015. Photo by Chris Majors. Thank you a billion, million, zillion times for following my advice and doing a 200,000-Vajrasattva retreat and for now doing OM MANI PADME HUM. I’m sure that you must be doing it with a bodhichitta motivation to free sentient beings – numberless hell beings, hungry ghosts, animals, humans, suras and auras – from oceans of samsaric suffering and bring them to the state of omniscience, sangye, elimination of all the obscurations and completion of all the realizations. In that case, with each OM MANI PADME HUM and Vajrasattva mantra, you are purifying the obscurations created over beginningless rebirths and collecting more than skies of merit. 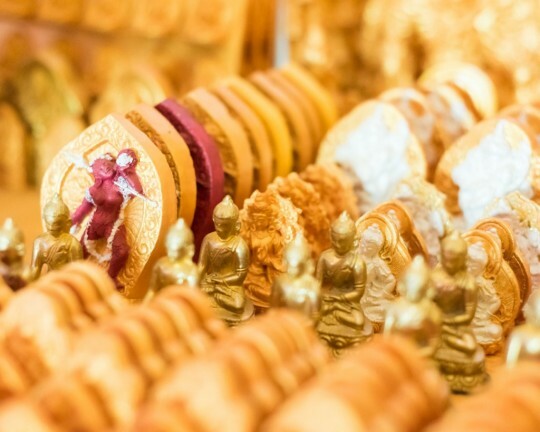 What it is saying is, for example, if you offer buddha worlds filled with the seven different jewels equal to the number of sand grains in your hand, even that merit is beyond our understanding. We can’t figure that merit out. That is unbelievable, unbelievable – most unbelievable merit. Now, here, it is talking about buddha worlds equaling the number of sand grains of the Pacific Ocean filled up with seven different jewels, so there’s no way we can understand the merit. It’s amazing, amazing, amazing, amazing, amazing. Now, somebody simply puts their hands at the heart and thinks: “May I achieve full enlightenment in order to free all the sentient beings from the oceans of samsaric suffering and bring them to a state of omniscience.” This creates more than skies of merit – much, much, much, greater than the previous example. The merit from the previous example becomes very small by comparison, even though it’s beyond our conception. Therefore, you have so much to rejoice about in this life.